Industry keynote at VDE / ITG Mobilkomtagung, Osnabrück, Germany, May 2018. Industry keynote at 12th ACM Workshop on Challenged Networks (CHANTS'17), Snowbird, UT, USA, October 2017. Managing Hyperconnected Entities - but how ? Panel at IEEE/IFIP Network Operations and Management Symposium (NOMS), Istanbul, Turkey, April 2016.
in "Management Frameworks for Future Mobile Communication Networks" Workshop at Future Networks & Mobile Summit 2013, Lisbon, Portugal, July 2013. Keynote at 6th International IFIP/IEEE Workshop on Distributed Autonomous Network Management Systems, Ghent, Belgium, May 2013. Tutorial at 9th International Conference on Design of Reliable Communication Networks (DRCN), Budapest, March 2013. Keynote at International Conference on Intelligence in Next Generation Networks (ICIN), Berlin, Germany, October 2012. Tutorial at 4th International Conference on Mobile Networks and Management, Hamburg, Germany, September 2012. 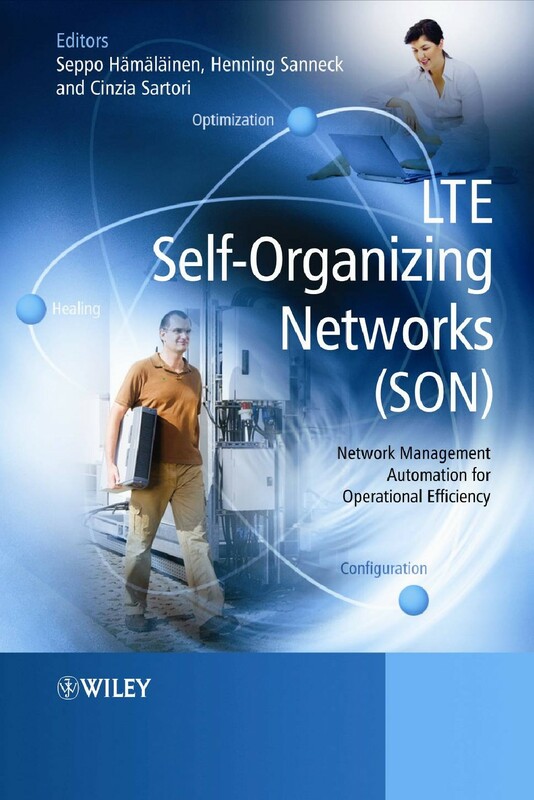 LTE Self-Organizing Networks (SON) - Network Management Automation for Operational Efficiency, Wiley, ISBN 978-1-119-97067-5, December 2011. The Ultimate Picture: Self-Evolving Networks ? Panel at Informa's Self Organizing Networks conference 2011, London, England, October 2011. Keynote at Broadband Convergence Networks Workshop, IM 2011, Dublin, Ireland, May 2011.
in Proceedings of the 17th World Wireless Research Forum, Heidelberg, Germany, November 2006.
in VDE ITG News, January 2019.
in IWPC Workshop on Open Networks, SDN & Virtualization Towards Telco-Cloud, Oxford, England, March 2018.
in ITG Technical Report #263: Mobile Communications - Technologies and Applications, VDE Verlag, 2016.
in IWPC workshop on "Forging a Path to Autonomous 5G Networks” , Cologne, Germany, June 2016.
in IEEE Transactions on Network and Service Management, Vol. 3(4), December 2016.
in 12th International Conference on Network and Service Management 2016 (CNSM), Montreal, Quebec, November 2016.
in IEEE Globecom 2015, San Diego, CA, December 2015.
in 7th International Conference on Mobile Networks and Management, Santander, Spain, September 2015.
in IFIP/IEEE Symposium on Integrated Management, Ottawa, Canada, May 2015.
in 6th International Conference on Mobile Networks and Management, Würzburg, Germany, September 2014.
in 4th IEEE International Workshop on Self-Organising Networks, Barcelona, Spain, August 2014.
in IEEE/IFIP Network Operations and Management Symposium (NOMS), Krakow, Poland, May 2014.
in 9th International Conference on Network and Service Management, Zurich, Switzerland, October 2013.
in IEEE 26th Annual Symposium on Personal, Indoor, and Mobile Radio Communications (PIMRC), Hong Kong, August 2015.
in IEEE International Symposium on a World of Wireless, Mobile and Multimedia Networks, Sydney, Australia, June 2014.
in 7th International Web Rule Symposium (RuleML 2013), Seattle, WA, USA, July 2013.
in 3rd IEEE International Workshop on Self-Organising Networks, Dresden, Germany, June 2013.
in IFIP/IEEE Symposium on Integrated Management, Ghent, Belgium, May 2013.
in 2nd International Workshop on Self-Organizing Networks, Paris, France, August 2012.
in 17th Asia-Pacific Conference on Communications, Sabah, Malaysia, October 2011.
in International Conference on Software Engineering and Knowledge Engineering, Miami Beach, FL, USA, July 2011.
in International Workshop on Self-Organizing Networks, Budapest, Hungary, May 2011.
in 6th International Wireless Communications and Mobile Computing Conference, Caen, France, June 2010.
in 11th International Conference on Network and Service Management 2015 (CNSM), Barcelona, Spain, November 2015.
in IFIP / IEEE Symposium on Integrated Management, Dublin, Ireland, May 2011.
in 7th International Symposium on Wireless Communication Systems, York, UK, September 2010.
in IEEE/IFIP Network Operations and Management Symposium, Osaka, Japan, April 2010.
in 5th International Wireless Communications and Mobile Computing Conference, Leipzig, Germany, June 2009.
in IFIP / IEEE Symposium on Integrated Management, New York, NY, USA, June 2009.
in IEEE WoWMoM Workshop on Autonomic Wireless AccesS 2007 (IWAS07), Helsinki, Finland, June 2007.
in Proceedings of the 18th World Wireless Research Forum, Helsinki, Finland, June 2007.
in IFIP / IEEE Symposium on Integrated Management, Munich, Germany, May 2007.
in 1st Annual Workshop on Distributed Autonomous Network Management Systems, Dublin, Ireland, June 2006.
in Praxis der Informationsverarbeitung und Kommunikation (PIK), 28(4):217--222, October 2005.
in Proceedings of the Sixth World Wireless Research Forum, London, England, June 2002.
in Proceedings of the Second World Wireless Research Forum, Helsinki, Finland, May 2001.
in S. Dixit and R. Prasad (Eds. ), Wireless IP and Building the Mobile Internet, Chapter 10, Artech House, Norwood, MA, USA, December 2002.
in Fourth International Symposium on Wireless Personal Multimedia Communication, Aalborg, Denmark, September 2001.
in Proceedings ACM Multimedia 2001, Ottawa, Canada, September 2001.
in First IP-Telephony Workshop, pp. 139-144, Berlin, Germany, April 2000.
in Proceedings of the SPIE/ACM SIGMM Multimedia Computing and Networking Conference 2000 (MMCN 2000), pp. 38-51, San Jose, CA, USA, January 2000.
in Proceedings INET '98, Geneva, Switzerland, July 1998.
in Proceedings IEEE Multimedia Systems, pp. 140-149, Austin, TX, USA, June 1998.
in Proceedings IEEE Global Internet 1996 (Jon Crowcroft and Henning Schulzrinne, eds. ), pp. 554-557, London, England, November 1996.
in Next Generation Internet in Europe, ACTS Project InfoWin (AC 113), pp. 16-19, ISBN 3-00-004250-4, 1999.
in Proceedings of the International Conference on Communications (ICC 2000), New Orleans, LA, USA, June 2000.
in Proceedings of the Eighth Conference on Computer Communications and Networks (ICCCN '99), pp. 419-426, Natick, MA, USA, October 1999.
in Internet Routing and Quality of Service, S. Civanlar, P. Doolan, J. Luciani, R.Onvural, Editors, Proceedings SPIE Vol.3529A, pp. 205-216, Boston, MA, USA, November 1998.
in The Third International Working Conference on Active Networks, Philadelphia, PA, USA, October 2001.
in The Second International Working Conference on Active Networks, Tokyo, Japan, October 2000.
in International Symposium on Broadband European Networks (SYBEN '98), Zurich, Switzerland, May 1998.
in Broadband Networking Technologies, Seyhan Civanlar, Indra Widjaja, Editors, Proceedings SPIE Vol.3233, pp. 78-88, Dallas, TX, USA, November 1997.
in Next Generation Internet in Europe, ACTS Project InfoWin (AC 113), pp. 97-103, ISBN 3-00-004250-4, 1999.
in Proceedings of the SPIE/ACM SIGMM Multimedia Computing and Networking Conference 2000 (MMCN 2000), pp. 177-187, San Jose, CA, USA, January 2000.
in First International Workshop on Quality for future Internet Services (QofIS 2000), Berlin, Germany, September 2000.
in Praxis der Informationsverarbeitung und Kommunikation (PIK) 3/98, September 1998. PhD thesis, GMD Fokus / Telecommunication Networks Group, Technical University Berlin, Berlin, Germany October 2000. Master's thesis (Diplomarbeit), Telecommunications Department, University of Erlangen-Nuremberg, Erlangen, Germany, June 1995. Project report (Studienarbeit), IRESTE, Universite de Nantes, Nantes, France, April 1994.